In light of the Great iPhone Alarm Foul-Up of 2011—not to mention a similar alarm problem from last November—many users may be on the search for a more reliable and feature-rich way to manage alarms on the iPhone and iPod touch. With Best Alarm Clock from myNewApps.com, users are promised a superior alarm clock experience, as well as dashboard information, like the temperature and weather conditions. Wake-Up Call: Best Alarm Clock provides more options for setting alarms than what you get with the default Clock app that ships with the iPhone and iPod touch. Users accustomed to the standard iOS Clock app and its alarms will find a welcoming home in Best Alarm Clock, as it packs in several features missing from the built-in app. For one, Best Alarm Clock allows users to select their own iTunes music, as well as many built-in sounds to use as alarms. Furthermore, alarms can be set to repeat on certain days of the week and the snooze time can be adjusted, unlike with the default iOS app. Best Alarm Clock’s interface doesn’t mesh with a minimalist experience, which might feel out of place to some iPhone users, but it is completely functional and extremely easy to use. The alarm screen itself has nice, big buttons for users who may be a bit groggy-eyed in the mornings. 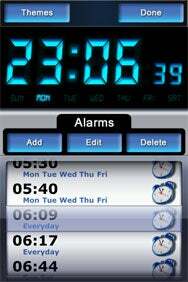 For iOS 4 users, Best Alarm Clock can run in the background, so there is no need to keep it running in the foreground for an alarm to still function. While the app does display the current temperature, the day’s high and low temperature forecasts, and the current weather conditions, it is far from a full-featured weather app. Still, it is nice to be able to have the current weather information at the ready when you wake up in the morning. The iPhone’s Clock app may come with your phone, but it doesn’t cost a lot to upgrade to a better and more fully-featured alarm experience. Best Alarm Clock is a cheap investment that delivers a superb product. A free version of Best Alarm Clock strips out some of the features—there are fewer built-in alarm sounds and you can’t use your own music, for example—but it’s a great way to try out the app at no cost.